Tired of winter foods and ready for a taste of spring? 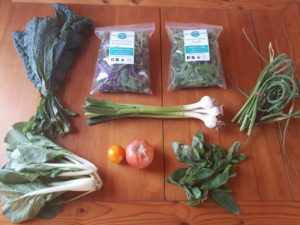 A Spring Greens CSA Share extends your season of eating locally. It increases your intake of farm fresh, certified organic, nutrient-dense greens. You will see and taste the difference from the grocery store. 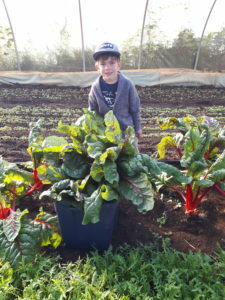 Our 5 heated greenhouses allow us to offer a unique Spring Community Supported Agriculture or CSA Share, before most Summer CSA programs have started. (See What is CSA? for more on this model). Members sign up to receive 8 weekly baskets of greens through May and June. 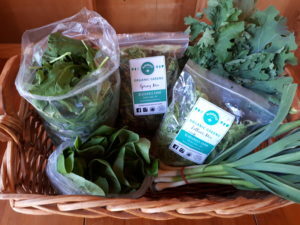 Each basket includes 5 bags or bunches of freshly harvested greens ready for salad, smoothies, or cooking. Items will include spinach, baby kale, mesclun mix, lettuce, arugula, baby swiss chard, mustard and Asian greens, garlic scapes, green garlic and more. Contents will vary each week based on availability. We are offering a Zero-Waste Pick-up option at both locations. Your greens will be packed loose in bulk bins. 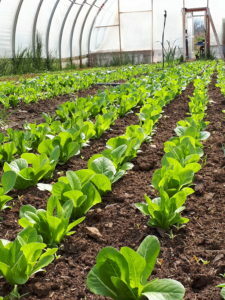 CSA members bring their own bags for each item, and we will pack and weigh your greens when you arrive. You can select this option on your sign-up form, or you can choose to have your greens prepacked in resealable plastic bags. Full payment is due by the time you pick up your first share. Payment can be made by cheque (to Bluegrass Farm, 714 Kinch St, Jasper ON, K0G 1G0), email money transfer (to Leela@bluegrassfarm.ca), or cash. All members must review our CSA Member Agreement before registering. If you still have questions, please visit our Frequently Asked Questions page, or don’t hesitate to contact us. By signing up and paying, you agree to the terms of the Member Agreement. 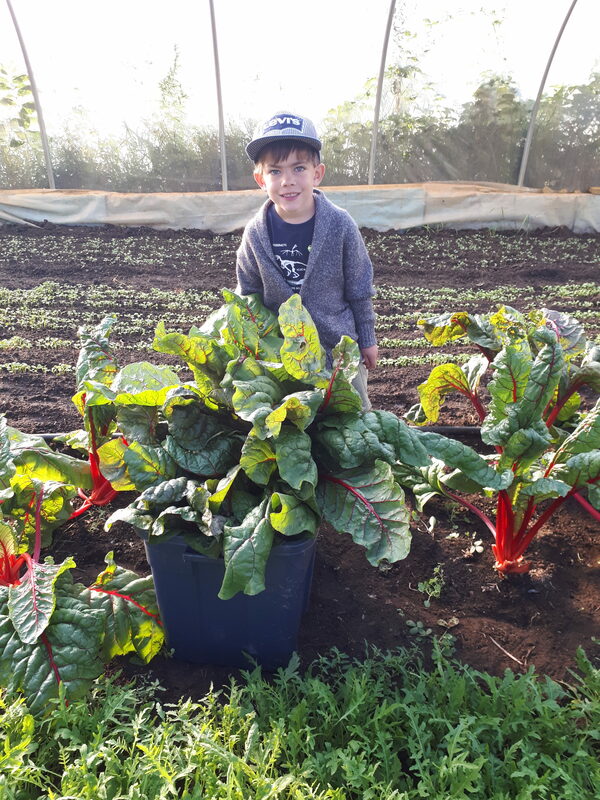 Visit our Testimonials page to read what our past CSA members say about their experience.